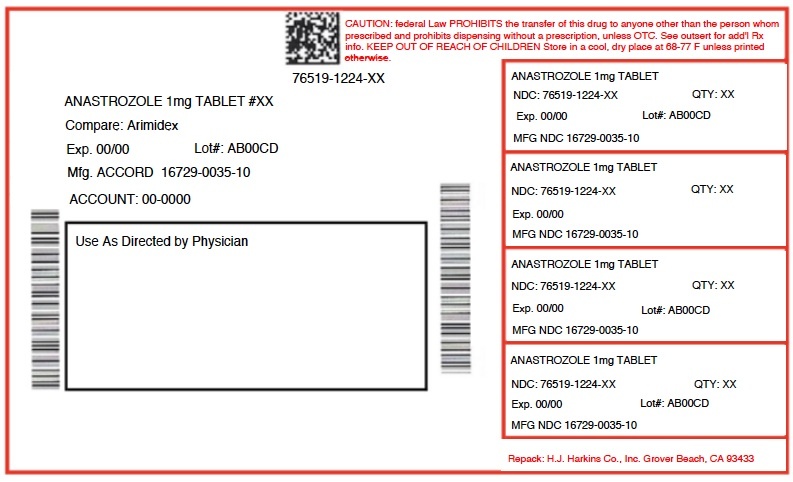 Non-Proprietary Name: Anastrozole What is the Non-Proprietary Name? Anastrozole with NDC 76519-1224 is a a human prescription drug product labeled by H.j. Harkins Company, Inc.. The generic name of Anastrozole is anastrozole. The product's dosage form is tablet and is administered via oral form. FDA Application Number: ANDA090568 What is the FDA Application Number? 1.1 Adjuvant TreatmentAnastrozole tablets are indicated for adjuvant treatment of postmenopausal women with hormone receptor-positive early breast cancer.1.2 First-Line TreatmentAnastrozole tablets are indicated for the first-line treatment of postmenopausal women with hormone receptor-positive or hormone receptor unknown locally advanced or metastatic breast cancer.1.3 Second-Line TreatmentAnastrozole tablets are indicated for the treatment of advanced breast cancer in postmenopausal women with disease progression following tamoxifen therapy. Patients with ER-negative disease and patients who did not respond to previous tamoxifen therapy rarely responded to anastrozole tablets. The tablets are white to off-white, round biconvex, film coated tablets, with “AHI” debossing on one side and plain on other side. 4.1 Pregnancy and Premenopausal WomenAnastrozole may cause fetal harm when administered to a pregnant woman and offers no clinical benefit to premenopausal women with breast cancer. Anastrozole is contraindicated in women who are or may become pregnant. There are no adequate and well-controlled studies in pregnant women using anastrozole. If anastrozole is used during pregnancy, or if the patient becomes pregnant while taking this drug, the patient should be apprised of the potential hazard to a fetus or potential risk for loss of the pregnancy [see Use in Specific Populations ( 8.1)].4.2 HypersensitivityAnastrozole is contraindicated in any patient who has shown a hypersensitivity reaction to the drug or to any of the excipients. Observed reactions include anaphylaxis, angioedema, and urticaria [see Adverse Reactions (6.2)]. 5.1 Ischemic Cardiovascular EventsIn women with pre-existing ischemic heart disease, an increased incidence of ischemic cardiovascular events was observed with anastrozole in the ATAC trial (17% of patients on anastrozole and 10% of patients on tamoxifen). 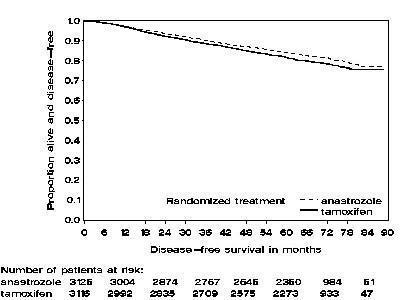 Consider risk and benefits of anastrozole therapy in patients with pre-existing ischemic heart disease [see Adverse Reactions ( 6.1)].5.2 Bone EffectsResults from the ATAC trial bone substudy at 12 and 24 months demonstrated that patients receiving anastrozole had a mean decrease in both lumbar spine and total hip bone mineral density (BMD) compared to baseline. Patients receiving tamoxifen had a mean increase in both lumbar spine and total hip BMD compared to baseline. Consider bone mineral density monitoring in patients treated with anastrozole [see Adverse Reactions ( 6.1)] .5.3 CholesterolDuring the ATAC trial, more patients receiving anastrozole were reported to have elevated serum cholesterol compared to patients receiving tamoxifen (9% versus 3.5%, respectively) [see Adverse Reactions ( 6.1)]. Serious adverse reactions with anastrozole occurring in less than 1 in 10,000 patients, are: 1) skin reactions such as lesions, ulcers, or blisters; 2) allergic reactions with swelling of the face, lips, tongue, and/or throat. This may cause difficulty in swallowing and/or breathing; and 3) changes in blood tests of the liver function, including inflammation of the liver with symptoms that may include a general feeling of not being well, with or without jaundice, liver pain or liver swelling [see Adverse Reactions (6.2)].Common adverse reactions (occurring with an incidence of ≥10%) in women taking anastrozole included: hot flashes, asthenia, arthritis, pain, arthralgia, hypertension, depression, nausea and vomiting, rash, osteoporosis, fractures, back pain, insomnia, headache, bone pain, peripheral edema, increased cough, dyspnea, pharyngitis and lymphedema.In the ATAC trial, the most common reported adverse reaction (>0.1%) leading to discontinuation of therapy for both treatment groups was hot flashes, although there were fewer patients who discontinued therapy as a result of hot flashes in the anastrozole group.Because clinical trials are conducted under widely varying conditions, adverse reaction rates observed in the clinical trials of a drug cannot be directly compared to rates in the clinical trials of another drug and may not reflect the rates observed in practice.6.1 Clinical Trials ExperienceAdjuvant TherapyAdverse reaction data for adjuvant therapy are based on the ATAC trial [see Clinical Studies (14.1)]. 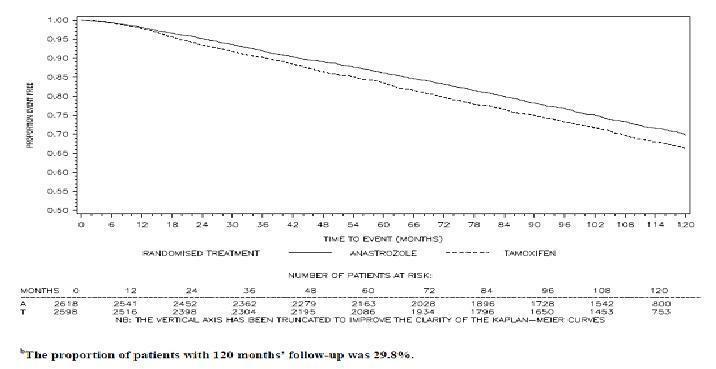 The median duration of adjuvant treatment for safety evaluation was 59.8 months and 59.6 months for patients receiving anastrozole 1 mg and tamoxifen 20 mg, respectively.Adverse reactions occurring with an incidence of at least 5% in either treatment group during treatment or within 14 days of the end of treatment are presented in Table 1.Table 1 - Adverse reactions occurring with an incidence of at least 5% in either treatment group during treatment, or within 14 days of the end of treatment in the ATAC trial *Body system and adverse reactions byCOSTART †preferred term ‡Anastrozole 1 mg(N § = 3092)Tamoxifen 20 mg(N § = 3094)Body as a wholeAsthenia575 (19)544 (18)Pain533 (17)485 (16)Back pain321 (10)309 (10)Headache314 (10)249 (8)Abdominal pain271 (9)276 (9)Infection285 (9)276 (9)Accidental injury311 (10)303 (10)Flu syndrome175 (6)195 (6)Chest pain200 (7)150 (5)Neoplasm162 (5)144 (5)Cyst138 (5)162 (5)CardiovascularVasodilatation1104 (36)1264 (41)Hypertension402 (13)349 (11)DigestiveNausea343 (11)335 (11)Constipation249 (8)252 (8)Diarrhea265 (9)216 (7)Dyspepsia206 (7)169 (6)Gastrointestinal disorder210 (7)158 (5)Hemic and lymphaticLymphedema304 (10)341 (11)Anemia113 (4)159 (5)Metabolic and nutritionalPeripheral edema311 (10)343 (11)Weight gain285 (9)274 (9)Hypercholesterolemia278 (9)108 (3.5)MusculoskeletalArthritis512 (17)445 (14)Arthralgia467 (15)344 (11)Osteoporosis325 (11)226 (7)Fracture315 (10)209 (7)Bone pain201 (7)185 (6)Arthrosis207 (7)156 (5)Joint Disorder184 (6)160 (5)Myalgia179 (6)160 (5)Nervous systemDepression413 (13)382 (12)Insomnia309 (10)281 (9)Dizziness236 (8)234 (8)Anxiety195 (6)180 (6)Paresthesia215 (7)145 (5)RespiratoryPharyngitis443 (14)422 (14)Cough increased261 (8)287 (9)Dyspnea234 (8)237 (8)Sinusitis184 (6)159 (5)Bronchitis167 (5)153 (5)Skin and appendagesRash333 (11)387 (13)Sweating145 (5)177 (6)Special SensesCataract Specified182 (6)213 (7)UrogenitalLeukorrhea86 (3)286 (9)Urinary tract infection244 (8)313 (10)Breast pain251 (8)169 (6)Breast Neoplasm164 (5)139 (5)Vulvovaginitis194 (6)150 (5)Vaginal Hemorrhage ¶122 (4)180 (6)Vaginitis125 (4)158 (5)* The combination arm was discontinued due to lack of efficacy benefit at 33 months of follow-up. † COSTART Coding Symbols for Thesaurus of Adverse Reaction Terms. ¶ Vaginal Hemorrhage without further diagnosis. Certain adverse reactions and combinations of adverse reactions were prospectively specified for analysis, based on the known pharmacologic properties and side effect profiles of the two drugs (see Table 2).Table 2 — Number of Patients with Pre-specified Adverse Reactions in ATAC Trial *AnastrozoleN=3092(%)TamoxifenN=3094(%)Odds-ratio95% CIHot Flashes1104 (36)1264 (41)0.800.73 to 0.89Musculoskeletal Events †1100 (36)911 (29)1.321.19 to 1.47Fatigue/Asthenia575 (19)544 (18)1.070.94 to 1.22Mood Disturbances597 (19)554 (18)1.100.97 to 1.25Nausea and Vomiting393 (13)384 (12)1.030.88 to 1.19All Fractures315 (10)209 (7)1.571.30 to 1.88Fractures of Spine, Hip, or Wrist133 (4)91 (3)1.481.13 to 1.95Wrist/Colles’ fractures67 (2)50 (2)Spine fractures43 (1)22 (1)Hip fractures28 (1)26 (1)Cataracts182 (6)213 (7)0.850.69 to 1.04Vaginal Bleeding167 (5)317 (10)0.500.41 to 0.61Ischemic Cardiovascular Disease127 (4)104 (3)1.230.95 to 1.60Vaginal Discharge109 (4)408 (13)0.240.19 to 0.30Venous Thromboembolic events87 (3)140 (5)0.610.47 to 0.80Deep Venous Thromboembolic Events48 (2)74 (2)0.640.45 to 0.93Ischemic Cerebrovascular Event62 (2)88 (3)0.700.50 to 0.97Endometrial Cancer ‡4 (0.2)13 (0.6)0.310.10 to 0.94* Patients with multiple events in the same category are counted only once in that category. † Refers to joint symptoms, including joint disorder, arthritis, arthrosis and arthralgia. Less frequent adverse experiences reported in patients receiving anastrozole 1 mg in either Trial 0030 or Trial 0027 were similar to those reported for second-line therapy.Based on results from second-line therapy and the established safety profile of tamoxifen, the incidences of 9 pre-specified adverse event categories potentially causally related to one or both of the therapies because of their pharmacology were statistically analyzed. No significant differences were seen between treatment groups.Table 4 — Number of Patients with Pre-specified Adverse Reactions in Trials 0030 and 0027Number (n) and Percentage of PatientsAdverse Reaction *Anastrozole1 mg(N=506)n (%)NOLVADEX20 mg(N=511)n (%)Depression23 (5)32 (6)Tumor Flare15 (3)18 (4)Thromboembolic Disease †18 (4)33 (6)Venous †515Coronary and Cerebral ‡1319Gastrointestinal Disturbance170 (34)196 (38)Hot Flushes134 (26)118 (23)Vaginal Dryness9 (2)3 (1)Lethargy6 (1)15 (3)Vaginal Bleeding5 (1)11 (2)Weight Gain11 (2)8 (2)* A patient may have had more than 1 adverse reaction. † Includes pulmonary embolus, thrombophlebitis, retinal vein thrombosis. 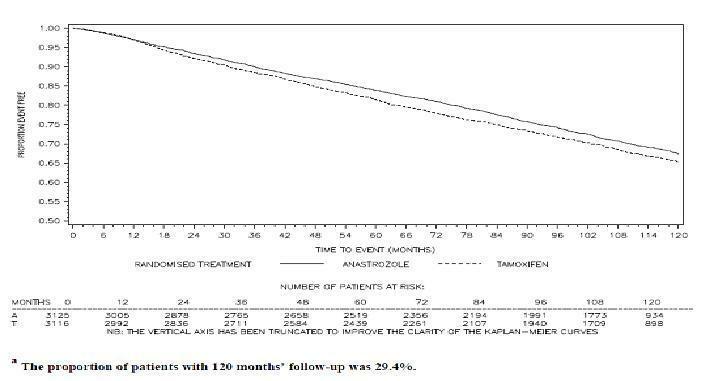 7.1 TamoxifenCo-administration of anastrozole and tamoxifen in breast cancer patients reduced anastrozole plasma concentration by 27%. However, the co-administration of anastrozole and tamoxifen did not affect the pharmacokinetics of tamoxifen or N-desmethyltamoxifen. At a median follow-up of 33 months, the combination of anastrozole and tamoxifen did not demonstrate any efficacy benefit when compared with tamoxifen in all patients as well as in the hormone receptor-positive subpopulation. This treatment arm was discontinued from the trial. [see Clinical Studies ( 14.1)] . 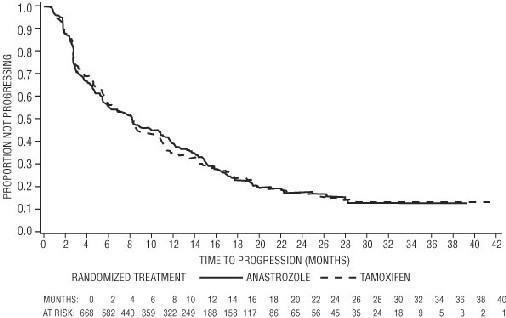 Based on clinical and pharmacokinetic results from the ATAC trial, tamoxifen should not be administered with anastrozole.7.2 EstrogenEstrogen-containing therapies should not be used with anastrozole as they may diminish its pharmacological action.7.3 WarfarinIn a study conducted in 16 male volunteers, anastrozole did not alter the exposure (as measured by Cmax and AUC), and anticoagulant activity (as measured by prothrombin time, activated partial thromboplastin time, and thrombin time) of both R- and S-warfarin.7.4 Cytochrome P450Based on in vitro and in vivo results, it is unlikely that co-administration of anastrozole 1 mg will affect other drugs as a result of inhibition of cytochrome P450 [see Clinical Pharmacology ( 12.3)]. 8.1 PregnancyPREGNANCY CATEGORY X [see Contraindications ( 4.1)]Anastrozole may cause fetal harm when administered to a pregnant woman and offers no clinical benefit to premenopausal women with breast cancer. Anastrozole is contraindicated in women who are or may become pregnant. In animal studies, anastrozole caused pregnancy failure, increased pregnancy loss, and signs of delayed fetal development. There are no studies of anastrozole use in pregnant women. If anastrozole is used during pregnancy, or if the patient becomes pregnant while receiving this drug, the patient should be apprised of the potential hazard to the fetus and potential risk for pregnancy loss.In animal reproduction studies, pregnant rats and rabbits received anastrozole during organogenesis at doses equal to or greater than 1 (rats) and 1/3 (rabbits) the recommended human dose on a mg/m 2basis. In both species, anastrozole crossed the placenta, and there was increased pregnancy loss (increased pre- and/or post-implantation loss, increased resorption, and decreased numbers of live fetuses). In rats, these effects were dose related, and placental weights were significantly increased. Fetotoxicity, including delayed fetal development (i.e., incomplete ossification and depressed fetal body weights), occurred in rats at anastrozole doses that produced peak plasma levels 19 times higher than serum levels in humans at the therapeutic dose (AUC 0-24hr 9 times higher). In rabbits, anastrozole caused pregnancy failure at doses equal to or greater than 16 times the recommended human dose on a mg/m 2 basis [see Animal Toxicology and/or Pharmacology ( 13.2)].8.3 Nursing MothersIt is not known if anastrozole is excreted in human milk. Because many drugs are excreted in human milk and because of the tumorigenicity shown for anastrozole in animal studies, or the potential for serious adverse reactions in nursing infants, a decision should be made whether to discontinue nursing or to discontinue the drug, taking into account the importance of the drug to the mother.8.4 Pediatric UseClinical studies in pediatric patients included a placebo-controlled trial in pubertal boys of adolescent age with gynecomastia and a single-arm trial in girls with McCune-Albright Syndrome and progressive precocious puberty. The efficacy of anastrozole in the treatment of pubertal gynecomastia in adolescent boys and in the treatment of precocious puberty in girls with McCune-Albright Syndrome has not been demonstrated.Gynecomastia StudyA randomized, double-blind, placebo-controlled, multi-center study enrolled 80 boys with pubertal gynecomastia aged 11 to 18 years. Patients were randomized to a daily regimen of either anastrozole 1 mg or placebo. After 6 months of treatment there was no statistically significant difference in the percentage of patients who experienced a ≥50% reduction in gynecomastia (primary efficacy analysis). Secondary efficacy analyses (absolute change in breast volume, the percentage of patients who had any reduction in the calculated volume of gynecomastia, breast pain resolution) were consistent with the primary efficacy analysis. Serum estradiol concentrations at Month 6 of treatment were reduced by 15.4% in the anastrozole group and 4.5% in the placebo group.Adverse reactions that were assessed as treatment-related by the investigators occurred in 16.3% of the anastrozole-treated patients and 8.1% of the placebo-treated patients with the most frequent being acne (7% anastrozole and 2.7% placebo) and headache (7% anastrozole and 0% placebo); all other adverse reactions showed small differences between treatment groups. One patient treated with anastrozole discontinued the trial because of testicular enlargement. The mean baseline-subtracted change in testicular volume after 6 months of treatment was + 6.6 ± 7.9 cm 3 in the anastrozole-treated patients and + 5.2 ± 8.0 cm 3 in the placebo group.McCune-Albright Syndrome StudyA multi-center, single-arm, open-label study was conducted in 28 girls with McCune-Albright Syndrome and progressive precocious puberty aged 2 to <10 years. All patients received a 1 mg daily dose of anastrozole. The trial duration was 12 months. Patients were enrolled on the basis of a diagnosis of typical (27/28) or atypical (1/27) McCune-Albright Syndrome, precocious puberty, history of vaginal bleeding, and/or advanced bone age. Patients’ baseline characteristics included the following: a mean chronological age of 5.9 ± 2.0 years, a mean bone age of 8.6 ± 2.6 years, a mean growth rate of 7.9 ± 2.9 cm/year and a mean Tanner stage for breast of 2.7 ± 0.81. Compared to pre-treatment data there were no on-treatment statistically significant reductions in the frequency of vaginal bleeding days, or in the rate of increase of bone age (defined as a ratio between the change in bone age over the change of chronological age). There were no clinically significant changes in Tanner staging,mean ovarian volume, mean uterine volume and mean predicted adult height. A small but statistically significant reduction of growth rate from 7.9 ± 2.9 cm/year to 6.5 ± 2.8 cm/year was observed but the absence of a control group precludes attribution of this effect to treatment or to other confounding factors such as variations in endogenous estrogen levels commonly seen in McCune-Albright Syndrome patients.Five patients (18%) experienced adverse reactions that were considered possibly related to anastrozole. These were nausea, acne, pain in an extremity, increased alanine transaminase and aspartate transaminase, and allergic dermatitis.Pharmacokinetics in Pediatric PatientsFollowing 1 mg once daily multiple administration in pediatric patients, the mean time to reach the maximum anastrozole concentration was 1 hr. The mean (range) disposition parameters of anastrozole in pediatric patients were described by a CL/F of 1.54 L/h (0.77 to 4.53 L/h) and V/F of 98.4 L (50.7 to 330.0 L). The terminal elimination half-life was 46.8 h, which was similar to that observed in postmenopausal women treated with anastrozole for breast cancer. Based on a population pharmacokinetic analysis, the pharmacokinetics of anastrozole was similar in boys with pubertal gynecomastia and girls with McCune- Albright Syndrome.8.5 Geriatric UseIn studies 0030 and 0027, about 50% of patients were 65 or older. Patients ≥ 65 years of age had moderately better tumor response and time to tumor progression than patients < 65 years of age regardless of randomized treatment. In studies 0004 and 0005, 50% of patients were 65 or older. Response rates and time to progression were similar for the over 65 and younger patients.In the ATAC study, 45% of patients were 65 years of age or older. 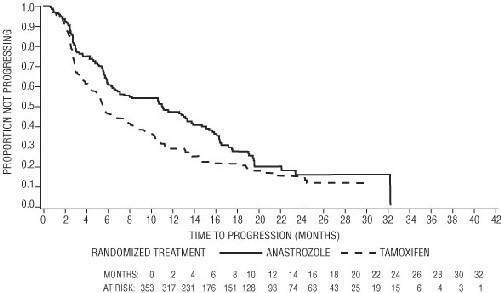 The efficacy of anastrozole compared to tamoxifen in patients who were 65 years or older (N=1413 for anastrozole and N=1410 for tamoxifen, the hazard ratio for disease-free survival was 0.93 [95% CI: 0.80, 1.08]) was less than efficacy observed in patients who were less than 65 years of age (N=1712 for anastrozole and N=1706 for tamoxifen, the hazard ratio for disease-free survival was 0.79 [95% CI: 0.67, 0.94]).The pharmacokinetics of anastrozole is not affected by age.8.6 Renal ImpairmentSince only about 10% of anastrozole is excreted unchanged in the urine, the renal impairment does not influence the total body clearance. Dosage adjustment in patients with renal impairment is not necessary [see Dosage and Administration ( 2.1) and Clinical Pharmacology ( 12.3)].8.7 Hepatic ImpairmentThe plasma anastrozole concentrations in the subjects with hepatic cirrhosis were within the range of concentrations seen in normal subjects across all clinical trials. Therefore, dosage adjustment is also not necessary in patients with stable hepatic cirrhosis. Anastrozole has not been studied in patients with severe hepatic impairment [see Dosage and Administration ( 2.2) and Clinical Pharmacology (12.3)]. Anastrozole tablets, USP for oral administration contain 1 mg of anastrozole, a non-steroidal aromatase inhibitor. 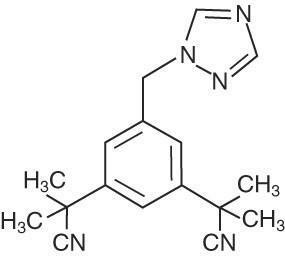 It is chemically described as 1,3-Benzenediacetonitrile, a, a, a', a'-tetramethyl-5-(1H-1,2,4-triazol-1-ylmethyl). Its molecular formula is C 17H 19N 5 and its structural formula is:Anastrozole is an off-white powder with a molecular weight of 293.4. Anastrozole has moderate aqueous solubility (0.5 mg/mL at 25°C); solubility is independent of pH in the physiological range. Anastrozole is freely soluble in methanol, acetone, ethanol, and tetrahydrofuran, and very soluble in acetonitrile.Each tablet contains as inactive ingredients: lactose monohydrate, magnesium stearate, hypromellose, macrogol, povidone, sodium starch glycolate, and titanium dioxide. 13.1 Carcinogenesis, Mutagenesis, Impairment of FertilityA conventional carcinogenesis study in rats at doses of 1.0 to 25 mg/kg/day (about 10 to 243 times the daily maximum recommended human dose on a mg/m 2 basis) administered by oral gavage for up to 2 years revealed an increase in the incidence of hepatocellular adenoma and carcinoma and uterine stromal polyps in females and thyroid adenoma in males at the high dose. A dose-related increase was observed in the incidence of ovarian and uterine hyperplasia in females. At 25 mg/kg/day, plasma AUC0-24 hr levels in rats were 110 to 125 times higher than the level exhibited in postmenopausal volunteers at the recommended dose. A separate carcinogenicity study in mice at oral doses of 5 to 50 mg/kg/day (about 24 to 243 times the daily maximum recommended human dose on a mg/m 2 basis) for up to 2 years produced an increase in the incidence of benign ovarian stromal, epithelial and granulosa cell tumors at all dose levels. A dose-related increase in the incidence of ovarian hyperplasia was also observed in female mice. These ovarian changes are considered to be rodent-specific effects of aromatase inhibition and are of questionable significance to humans. The incidence of lymphosarcoma was increased in males and females at the high dose. At 50 mg/kg/day, plasma AUC levels in mice were 35 to 40 times higher than the level exhibited in postmenopausal volunteers at the recommended dose.Anastrozole has not been shown to be mutagenic in in vitro tests (Ames and E. coli bacterial tests, CHO-K1 gene mutation assay) or clastogenic either in vitro (chromosome aberrations in human lymphocytes) or in vivo (micronucleus test in rats).Oral administration of anastrozole to female rats (from 2 weeks before mating to pregnancy day 7) produced significant incidence of infertility and reduced numbers of viable pregnancies at 1 mg/kg/day (about 10 times the recommended human dose on a mg/m 2 basis and 9 times higher than the AUC 0-24 hr found in postmenopausal volunteers at the recommended dose). Pre-implantation loss of ova or fetus was increased at doses equal to or greater than 0.02 mg/kg/day (about one-fifth the recommended human dose on a mg/m 2 basis). Recovery of fertility was observed following a 5-week non-dosing period which followed 3 weeks of dosing. It is not known whether these effects observed in female rats are indicative of impaired fertility in humans.Multiple-dose studies in rats administered anastrozole for 6 months at doses equal to or greater than 1 mg/kg/day (which produced plasma anastrozole C ssmax and AUC 0-24 hr that were 19 and 9 times higher than the respective values found in postmenopausal volunteers at the recommended dose) resulted in hypertrophy of the ovaries and the presence of follicular cysts. In addition, hyperplastic uteri were observed in 6-month studies in female dogs administered doses equal to or greater than 1 mg/kg/day (which produced plasma anastrozole C ssmax and AUC 0-24 hr that were 22 times and 16 times higher than the respective values found in postmenopausal women at the recommended dose). It is not known whether these effects on the reproductive organs of animals are associated with impaired fertility in premenopausal women.13.2 Animal Toxicology and/or PharmacologyReproductive ToxicologyAnastrozole has been found to cross the placenta following oral administration of 0.1 mg/kg in rats and rabbits (about 1 and 1.9 times the recommended human dose, respectively, on a mg/m 2 basis). Studies in both rats and rabbits at doses equal to or greater than 0.1 and 0.02 mg/kg/day, respectively (about 1 and 1/3, respectively, the recommended human dose on a mg/m 2 basis), administered during the period of organogenesis showed that anastrozole increased pregnancy loss (increased pre- and/or post-implantation loss, increased resorption, and decreased numbers of live fetuses); effects were dose related in rats. Placental weights were significantly increased in rats at doses of 0.1 mg/kg/day or more.Evidence of fetotoxicity, including delayed fetal development (i.e., incomplete ossification and depressed fetal body weights), was observed in rats administered doses of 1 mg/kg/day (which produced plasma anastrozole C ssmax and AUC 0-24 hr that were 19 times and 9 times higher than the respective values found in postmenopausal volunteers at the recommended dose). There was no evidence of teratogenicity in rats administered doses up to 1.0 mg/kg/day. In rabbits, anastrozole caused pregnancy failure at doses equal to or greater than 1.0 mg/kg/day (about 16 times the recommended human dose on a mg/m 2 basis); there was no evidence of teratogenicity in rabbits administered 0.2 mg/kg/day (about 3 times the recommended human dose on a mg/m 2 basis). # Among the patients who had breast conservation, radiotherapy was administered to 95.0% of patients in the anastrozole arm, 94.1% in the tamoxifen arm and 94.5% in the anastrozole plus tamoxifen arm. Patients in the two monotherapy arms of the ATAC trial were treated for a median of 60 months (5 years) and followed for a median of 68 months. 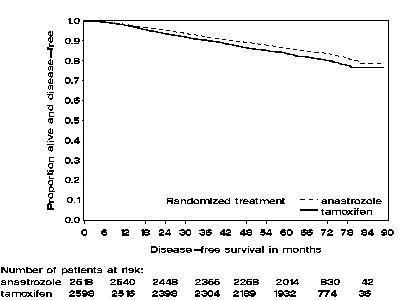 Disease-free survival in the intent- to-treat population was statistically significantly improved [Hazard Ratio (HR) = 0.87, 95% CI: 0.78, 0.97, p=0.0127] in the anastrozole arm compared to the tamoxifen arm. In the hormone receptor-positive subpopulation representing about 84% of the trial patients, disease-free survival was also statistically significantly improved (HR =0.83, 95% CI: 0.73, 0.94, p=0.0049) in the anastrozole arm compared to the tamoxifen arm.Figure 1- Disease-Free Survival Kaplan Meier Survival Curve for all Patients Randomized to Anastrozole or Tamoxifen Monotherapy in the ATAC trial (Intent-to-Treat)Figure 2- Disease-free Survival for Hormone Receptor-Positive Subpopulation of Patients Randomized to Anastrozole or Tamoxifen Monotherapy in the ATAC TrialThe survival data with 68 months follow-up is presented in Table 9.In the group of patients who had previous adjuvant chemotherapy (N=698 for anastrozole and N=647 for tamoxifen), the hazard ratio for disease-free survival was 0.91 (95% CI: 0.73 to 1.13) in the anastrozole arm compared to the tamoxifen arm.The frequency of individual events in the intent-to-treat population and the hormone receptor-positive subpopulation are described in Table 8.Table 8 - All Recurrence and Death Events *Intent-To-Treat Population †Hormone Receptor-Positive Subpopulation †Anastrozole1 mg(N ‡=3125)Tamoxifen20 mg(N ‡=3116)Anastrozole1 mg(N ‡=2618)Tamoxifen20 mg(N ‡=2598Number (%) of PatientsNumber (%) of PatientsMedian Duration of Therapy (mo)60606060Median EfficacyFollow-up (mo)68686868Loco-regional recurrence119 (3.8)149 (4.8)76 (2.9)101 (3.9)Contralateral breast cancer35 (1.1)59 (1.9)26 (1.0)54 (2.1)Invasive27 (0.9)52 (1.7)21 (0.8)48 (1.8)Ductal carcinomain situ8 (0.3)6 (0.2)5 (0.2)5 (0.2)Unknown01 (<0.1)01 (<0.1)Distant recurrence324 (10.4)375 (12.0)226 (8.6)265 (10.2)Death from Any Cause411 (13.2)420 (13.5)296 (11.3)301 (11.6)Death breast cancer218 (7.0)248 (8.0)138 (5.3)160 (6.2)Death other reason(including unknown)193 (6.2)172 (5.5)158 (6.0)141 (5.4)* The combination arm was discontinued due to lack of efficacy benefit at 33 months of follow-up. † Patients may fall into more than one category. Anastrozole tablets, USP 1 mg are white to off-white, round biconvex, film coated tablets, with “AHI” debossing on one side and plain on other side. Store at controlled room temperature, 20 to 25°C (68 to 77°F) [see USP]. Preserve in tight container. “See FDA approved patient labeling (Patient Information).”17.1 PregnancyPatients should be advised that anastrozole may cause fetal harm. They should also be advised that anastrozole is not for use in premenopausal women; therefore, if they become pregnant, they should stop taking anastrozole tablets and immediately contact their doctor.17.2 Allergic (Hypersensitivity) ReactionsPatients should be informed of the possibility of serious allergic reactions with swelling of the face, lips, tongue and/or throat (angioedema) which may cause difficulty in swallowing and/or breathing and to seek medical attention immediately.17.3 Ischemic Cardiovascular EventsPatients with pre-existing ischemic heart disease should be informed that an increased incidence of cardiovascular events has been observed with anastrozole use compared to tamoxifen use. If patients have new or worsening chest pain or shortness of breath they should seek medical attention immediately.17.4 Bone EffectsPatients should be informed that anastrozole lowers the level of estrogen. This may lead to a loss of the mineral content of bones, which might decrease bone strength. A possible consequence of decreased mineral content of bones is an increase in the risk of fractures.17.5 CholesterolPatients should be informed that an increased level of cholesterol might be seen while receiving anastrozole.17.6 Tickling, Tingling or NumbnessPatients should be informed that if they experience tickling, tingling, or numbness they should notify their health care provider.17.7 TamoxifenPatients should be advised not to take anastrozole with tamoxifen.17.8 Missed DosesInform patients that if they miss a dose, take it as soon as they remember. If it is almost time for their next dose, skip the missed dose and take the next regularly scheduled dose. Patients should not take two doses at the same time. anastrozole tablets include: swelling of the face, lips, tongue or throat, trouble breathing or swallowing, hives and itching. What should I tell my doctor before taking anastrozole tablets?Before you take anastrozole tablets, tell your doctor if you:have not gone through menopause. Talk to your doctor if you are not sure. Know the medicines you take. Keep a list of them to show your doctor and pharmacist when you get a new medicine.How should I take anastrozole tablets?Take anastrozole tablets exactly as your doctor tells you to take it. Continue taking anastrozole tablets until your doctor tells you to stop.Anastrozole tablets can be taken with or without food.If you miss a dose, take it as soon as you remember. If it is almost time for your next dose, skip the missed dose. Take your next regularly scheduled dose. Do not take two doses at the same time. What are the possible side effects of anastrozole tablets?Anastrozole tablets may cause serious side effects including:See “ What is the most important information I should know about anastrozole tablet ?”bone thinning or weakness (osteoporosis). Anastrozole lowers estrogen in your body, which may cause your bones to become thinner and weaker. This may increase your risk of fractures, especially of your spine, hip and wrist. Your doctor may order a bone mineral density test before you start and during treatment with anastrozole tablets to check you for bone changes. swelling of your face, lips, tongue, or throat.trouble swallowing or breathingliver problems. Anastrozole can cause inflammation of your liver and changes in liver function blood tests. Your doctor may check you for this.Stop taking anastrozole tablets and call your doctor right away if you have any of these signs or symptoms of a liver problem:a general feeling of not being wellyellowing of your skin or whites of your eyespain on the right side of your stomach-area (abdomen)Common side effects in women taking anastrozole tablets include:hot flashesweaknessjoint achesjoint pain, stiffness or swelling (arthritis)painsore throathigh blood pressuredepressionnausea and vomitingrashback painsleep problemsbone painheadacheswelling of your legs, ankles, or feetincreased coughshortness of breathbuild up of lymph fluid in the tissues of your affected arm (lymphedema)Anastrozole tablets may also cause you to have tickling, tingling or numbness of your skin.Tell your doctor if you have any side effect that bothers you or that does not go away.These are not all the possible side effects of anastrozole tablets. For more information, ask your doctor or pharmacist.Call your doctor for medical advice about side effects. You may report side effects to FDA at 1-800-FDA-1088.How should I store anastrozole tablets?Store anastrozole tablets at room temperature between 68°F to 77°F (20°C to 25°C). Preserve in tight container.Keep anastrozole tablets and all medicines out of the reach of children.General information about the safe and effective use of anastrozole tablets.Medicines are sometimes prescribed for purposes other than those listed in a Patient Information leaflet. Do not take anastrozole tablets for a condition for which it was not prescribed. Do not give anastrozole tablets to other people, even if they have the same symptoms that you have. It may harm them.If you would like more information, talk with your doctor. You can ask your pharmacist or doctor for information about anastrozole tablets that is written for health professionals.What are the ingredients in anastrozole tablets?Active ingredient: anastrozoleInactive ingredients: lactose monohydrate, magnesium stearate, hypromellose, macrogol, povidone, sodium starch glycolate, and titanium dioxide.